Lots of trees have been coming down in our neighborhood lately. Some have been due to storms, an act of God. Others have been due to Rodney, our next door neighbor. And as much as it breaks my heart to see gone the 50 year old oak that once stood guard at the foot of the driveway (the dividing line between Rodney's property & ours), I know that it will eventually be okay - there will be dogwoods planted in its place (as flowers on the oak tree's grave?) & our front yard is receiving lots more sunlight, so I can foresee more flowers next year. This past weekend Rodney scaled the hackberry trees to trim branches (the trees he left standing) & I see more light on the already existing dogwoods, and Katie is contemplating white azaleas surrounding them. An oddity we discovered was a sign in another neighbor's back yard. Once branches were removed, Katie & I spied a sign pointing the way to Post Oak Cemetery, except that it was pointing the way to our house. I'm assuming the sign was being used as a makeshift barrier to prevent the dogs, Chloe & Teddy, from escaping from the yard - especially Teddy, who the ever-wonderful Michael & I once saw accidentally leap over monkey grass into the creek (Teddy being such a small dog he couldn't see over the monkey grass: he had no way to know there was nothing by a long drop on the other side) while chasing a squirrel. His eye was on the squirrel - he would make a great shortstop. ANYWAY, I looked at Katie - "Is that good feng-shui?" I asked, referring to the cemetery sign pointing our way. "Well", replies the lovely Katie, "I'm not afraid of dead people, but . . . " "It can't be good", I say. Whereupon she decides to just scooch her fingers through the fence & turn the sign around so that the arrow points back at her (the neighbor's) house. Easier said than done, and kind of mean to boot, so we decided that the arrow should point to Heaven. I would've gotten closer to take a picture of the whole sign, but a copperhead was discovered in that neighbor's yard a few weeks ago, and I was wearing flip-flops. 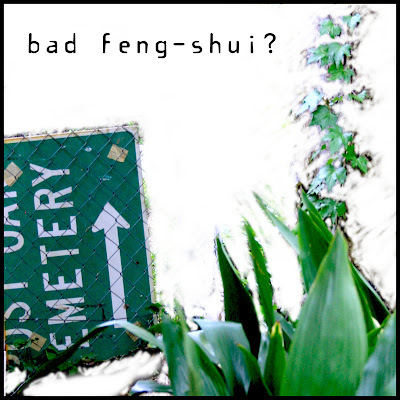 That would be bad feng-shui. Love the rose yesterday, love the sign today! Talk to you soon. Christy - thanks for keeping in touch. I'm sorry I've been so remiss in doing the same. I PROMISE a long email this weekend! Yhat is so funny about the cemetary sign. It is apprapo where it has ended up. It's really weird that we never noticed it. Plus - how did my neighbor end up with it? I mean, surely she wouldn't steal a cemetary sign! ??? ?